Captain Bjorne Kvernmo, who first began hunting seals more than four decades ago, guides MS Havsel into the harbour of Tromso, the Norwegian city that owes its existence to his trade. But his vessel is not arriving laden with dead seals. Rather, he and his crew are in Tromso for the premiere of a documentary about Norway's last seal-hunting expedition to the dangerous ice edge off the coast of Greenland. Sealers - One Last Hunt is an unashamed celebration of a controversial industry that a century ago numbered more than 200 ships. Their owners, captains and crews did much to shape the economy of coastal Norway, which stretches north of the Polar Circle towards Russia and the Barents Sea. 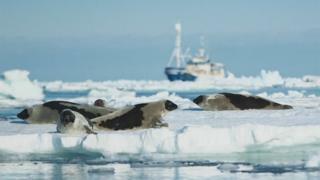 Along with many locals, the documentary's producers lament the demise of the seal-hunting industry. "People buy meat in the store that's packed in plastic, and they don't want to see how animals are killed," says co-producer Trude Berge Ottersen. "Seal hunting is an old culture and tradition. It's been a big part of northern Norwegian culture. So for me it's better to eat seal meat than to eat chicken or produced salmon." Accusations of animal cruelty have long been levelled at seal hunters in the Arctic by campaigners. The International Fund for Animal Welfare (IFAW) describes the commercial hunts as "cruel and wasteful". The Humane Society refers to "defenceless pups [that] die a cruel death". Greenpeace is opposed to what it calls an "inhumane and cruel industrial hunt", while defending traditional hunting by Arctic Indigenous communities. Images of bleeding seals purportedly clubbed to death by brutal hunters have been a persuasive feature of anti-sealing campaigns that eventually brought the Norwegian seal-hunting industry to its knees. And while the film also features pools of red-hot seal blood as it mixes with pristine white snow and blue ice, it paints a more nuanced picture by offering an insight into the harsh conditions endured by the Arctic hunters. Mr Kvernmo believes the protesters who have shaped public opinion have misunderstood the situation. "I know a lot of their information is wrong - it's not a real picture of what's going on," he says. Gry Elisabeth Mortensen, who co-produced the documentary with Ms Ottersen, agrees. Seals are no longer clubbed to death, she explains. Rather, high-powered guns with expanding bullets are used to deliver a swift death. "I think it's perhaps the most ethical meat you can have," Ms Mortensen argues. "The seals are lying on the ice, maybe sleeping, and then they get a shot in the head, and that's it." After the seals have been shot, dedicated "jumpers" use the hakapik hunting tool - a heavy wooden club with a hammer head and a hook. The jumpers deliver blows to the animals' heads to ensure they are dead, before hooking them and dragging them back to the boat. "We are doing it in the most humane way that it could be done," Mr Kvernmo says. However, the entire debate about whether Norwegian seal hunting is cruel has been rendered largely irrelevant by a 2009 European Union ban on trade in seal products. That includes skins that are made into boots and jackets, omega 3-rich oil used in food supplements, and meat that has been served in restaurants or cooked in homes across the Arctic region. Seal-skin boots can still be bought in Tromso's shoe shops, but probably not for much longer. "It's over," says Mr Kvernmo as he heads into the cinema for the screening of the documentary. "In Norway, there's nobody hunting anymore. The protest industry has been the winner." However, the withdrawal in 2015 of a 12m kroner (about £1m) Norwegian government subsidy means the practice is no longer economically viable. Subsidies had accounted for up to 80% of sealers' income. More lucrative opportunities now await Mr Kvernmo. These days, his boat is kept afloat by fees from film crews, which help ensure seasoned seal hunters' knowledge about the Arctic lives on. "Throughout all these years on the ice and at sea, Bjorne really has a lot of knowledge and respect for the nature and the animal life there," says Ms Ottersen. Mr Kvernmo is also working for the oil and gas sector, again putting him at odds with environmentalists. "We don't think there's any room for oil in the Arctic," Jennifer Morgan, executive director of Greenpeace, told the recent Arctic Frontiers conference in Tromso. Norwegian energy giant Statoil has been exploring the Arctic for oil and gas. Bjorn Otto Sverdrup, its head of sustainability, defends its policy and says there has to be a gradual shift to renewable energy. "We cannot change that system overnight." The Norwegian government also argues that oil and gas exploration can take place safely in the Arctic. "We have shown that it is fully possible to combine ocean-based industries, such as fisheries, aquaculture, shipping and energy, and a healthy marine environment," Prime Minister Erna Solberg told the Arctic Frontiers conference. "But it is crucial to set high environmental standards and ensure that these are met." Norway is also set to announce a national ocean strategy. "Sustainable use of ocean resources is the very foundation of Norway's prosperity and well-being," Ms Solberg said. Although the formerly lucrative seal hunt has become a thing of the past, Norway's Arctic gold rush appears to be far from over.